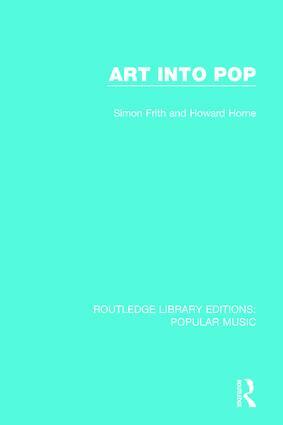 This book, first published in 1987, tells the intriguing and culturally complex story of the art school influence on postwar British popular music. Following Romantic attitudes from life class to recording studio, it focuses on two key moments – the early 1960s, when art students like John Lennon and Eric Clapton begin to play their own versions of American rock and blues and inflected youth music with Bohemian dreams, and the late 1970s, when punk musicians emerged from design courses and fashion departments to disrupt what were, by then, art-rock routines. Sixties rock Bohemians and seventies pop Situationists were, in their different ways, trying to solve the art students’ perennial problem – how to make a living from their art. Art Into Pop shows how this problem has been shaped by the history of British art education, from its nineteenth-century origins to current arguments about ‘pure’ and ‘applied’ training. In their simultaneous pursuit of authenticity and artifice, art school musicians exemplify the postmodern condition, the collapse of any distinction between ‘high’ and ‘low’ culture, the confusions of personal and commercial creativity. And so high pop theorists rub shoulders here with low pop practitioners, experimental musicians debate avant-garde ideas with corporate packagers, and artistic integrity becomes a matter of making oneself up.